WestJet CEO Gregg Saretsky says the company will be filing a statement of defence in a lawsuit that alleges the company failed to respond properly to an allegation that a pilot sexually assaulted a flight attendant. Writing on the WestJet blog Friday, Saretsky says that the company followed its code of conduct and ethics. "Investigations did take place on these matters and they were subsequently closed," he writes. "We are reviewing the investigations to ensure they were diligently carried out, and no new information has come to light since the investigations were undertaken six years ago." A spokesperson from the company told CBC News Friday that both the pilot and another flight attendant named in the lawsuit are currently not on active flying duty. WestJet declined to say when the decision to ground the two staff members had taken place. In his blog post, Saretsky writes that the decision was made "out of concern for their well-being and the continued safe operation of the airline." A petition calling for Saretsky's resignation was launched after news of the lawsuit filed by the former WestJet flight attendant emerged on Wednesday. Mandalena (Mandy) Lewis is suing the Calgary-based airline, claiming she was sexually assaulted by a pilot in 2010 during a layover in Hawaii. She alleges the company protected the pilot and fired her instead. Saretsky writes in his blog post that WestJet has a strong reporting culture. "Regardless of its nature, each complaint made through our whistleblower hotline, including the outcomes of the investigations, is reported to the safety, health and environment committee of our board of directors," he says. "We have always treated any complaint with the seriousness it deserves and will continue to do so." Saretsky says the reports that further complainants have come forward is not true, and the company has received no more information on the matter. "We encourage our employees to report any concern that goes against our code of conduct or where they feel safety is at risk, and we urge them to bring any new information to our attention," he says. Saretsky also writes that accusations that WestJet have fired employees for attempting to organize a union are "patently false," and that a response to such a claim with the Canada Industrial Relations Board has been filed. Saretsky says he is confident WestJet's staff will continue to provide their "brand of friendly, caring service" as the company works though these "as yet unfounded" allegations. WestJet told CBC News the statement of defence will be filed on March 23. Kenya Civil Aviation Authority’s capacity and the civil aviation system will be the areas of focus when the country’s final audit for direct flights between Nairobi and the US is done. This is according to US Federal Aviation Administration’s International Aviation Safety Assessment procedure, which concentrates on the processes and documentations of a country’s regulatory body. The IASA assessment checklist is divided into nine sections corresponding to eight critical elements of safety oversight system, as defined by the International Civil Aviation Organization. It also has a section covering general information and air operator complexity. Kenya which is expecting an IASA assessment this year will be evaluated on its primary aviation legislation, specific operating regulations, state civil aviation system and safety oversight functions. Its technical personnel qualifications and training will also be reviewed. Other areas will be the country’s, technical guidance, tools, provision of safety critical information, licensing, certification, authorization and approval obligations, surveillance obligations and resolution of safety concerns. The country is gearing up for the final audit by FAA which if passed, will see Jomo Kenyatta International Airport upgraded to a category one status, a requirement for direct flights to the US. According to KCAA which has indicated readiness for the audit, Kenya has to score a minimum 80 per cent in the IASA audit to qualify. Kenya is inching closer to the upgrade after scoring 88 percent in a security audit by ICAO, conducted between September 17 and 24, 2014. “We are ready for them. With the measures in place and the performance in the ICAO security audit, we believe we will make it,” KCAA director general Gilbert Kibe told the Star in an interview last month. Injuries: 1 Fatal, 2 Uninjured. A helicopter with a pilot, a hoist operator, and a helicopter rescue specialist (rescuer) on board was dispatched to transport an injured person out of an area of rough terrain. Based on the patient's location and the time of the call, a night hoist operation was planned. The helicopter arrived on scene, and the hoist operator lowered the rescuer and equipment from the helicopter. While the rescuer and ground personnel prepared the patient for transport, the pilot and hoist operator looked for a nearby landing zone. Upon hearing radio calls from the rescuer that the patient was ready, the helicopter returned to the patient's location, and the hoist operator lowered the hoist hook. The patient, who was in a Bauman bag, and the rescuer were then lifted from the ground by the hoist. The hoist operator continued to reel in the patient and the rescuer as the helicopter transitioned from a hover to forward flight. When the patient and rescuer were about 10 ft below the helicopter's skids, the rescuer fell about 100 ft to the ground. The ground personnel who helped the rescuer prepare the patient for transport did not report seeing anything unusual. They said that, during the initial part of the lift, the rescuer and patient went into some tree branches, the helicopter maneuvered away from the tree, and then the rescuer and patient were lifted up towards the helicopter. Examination of the rescuer's equipment did not reveal any failures or malfunctions that would explain the fall. Additionally, examination of the hoist hook and helicopter equipment did not reveal any abnormities. Also, review of video from a camera located on the hoist did not identify any failures in the equipment nor did it show how the rescuer was initially hooked into the hoist. In the absence of any equipment failure, it is likely that the rescuer was not properly fastened to the hoist. The helicopter rescue specialist was not properly attached to the hoist system, which resulted in a fall during a night hoist operation. On April 27, 2015, about 2150 central daylight time, a helicopter rescue specialist (rescuer) fell during an external hoist rescue operation. 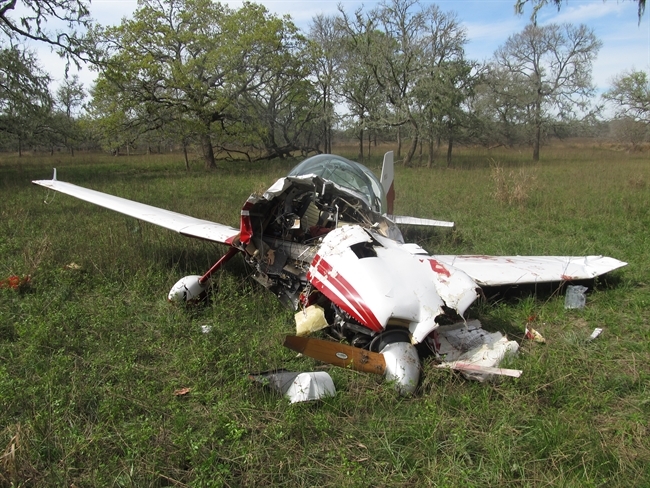 The rescuer received fatal injuries; the pilot, flight paramedic and patient were not injured. The Eurocopter MBB BK 117 helicopter, N392TC, was not damaged during the accident. The helicopter was registered to the Travis County Purchasing office and operated by STAR Flight, Austin, Texas, as a public aircraft operation. Night visual meteorological conditions prevailed during the local rescue flight. STAR Flight operations was contacted in response to an injured individual located on the greenbelt of Barton Creek. First responders, consisting of ground units assessed that based on the patient's condition and the difficulty in transporting the patient out difficult/steep terrain, that an air rescue was necessary. The pilot, hoist operator (paramedic), and helicopter rescue specialist, gathered the required equipment and before departure and en route, completed the normal equipment checks. Shortly after arriving at the patient's location, the rescuer and the medical equipment were hoisted to the ground. The helicopter's hoist operator later deployed a backboard for the patient. During the time the rescuer was on the ground and was preparing the patient for the hoist operation, the flight crew had chosen a running track, located near a school, for a landing zone. 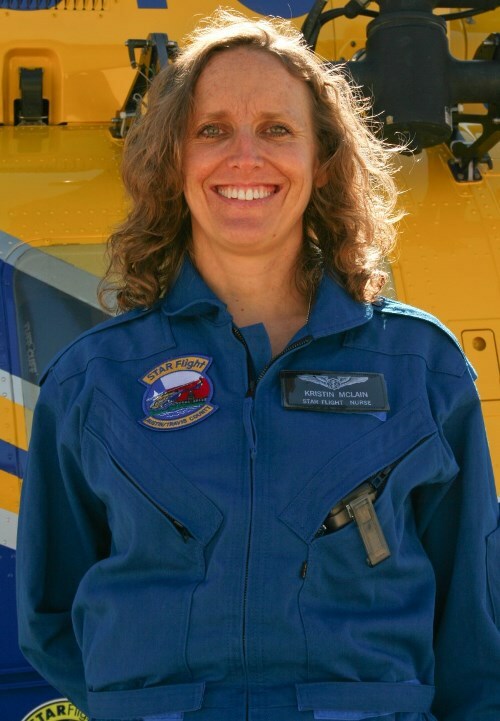 After the rescuer had secured the patient in the Bauman bag, she radioed the helicopter; the helicopter moved into position and extended the hook to her. After receiving "ready for extraction", the hoist operator initiated the lift to the helicopter. Once the rescuer and patient cleared the trees, the patient and rescuer, began a steady spin. To arrest the spin, the pilot started moving the helicopter forward. The spin slowed and had essentially stopped as they were hoisted upwards. As they neared the helicopter, the rescuer then fell away from the patient and hoist. With the patient slightly below the helicopter, the flight crew continued to the rendezvous location, where the patient would be transferred via ambulance to the hospital. Once the helicopter arrived at the landing zone, emergency personnel disconnected the patient from the hoist connection. The pilot then landed the helicopter, and the hoist operator retrieved the medical bag that was on the hoist. The pilot and hoist operator then departed to assist in looking for the rescuer. Shortly, afterwards the helicopter landed back at the landing zone. The pilot reported that they were dispatched to rescue an injured hiker in the green belt area. The wind was reported from 350 degrees at 5 knots, but noted that it could be a bit more turbulent in the rescue area; so they would approach the area from the north. They deployed the rescuer and a little later, a backboard, to the rescuer. They then looked for a 7 meter [landing zone/rendezvous] location, and then loitered in the green belt area, waiting for the rescuer's call for extraction. After receiving the radio call from the rescuer, they proceeded to the rescuer's area and conducted the hoist operation. Upon hearing "axis clear" from the hoist operator, he transitioned to forward flight; he added that they were approximately 100-120 feet AGL, with the rescuer and patient just below the skids when the hoist operator stated the rescuer was gone and had fallen from the hook. The hoist operator reported that they were dispatched for a wilderness rescue. He and the rescuer completed the safety checks of their equipment prior to launch. Once at the rescuer area, he reported they deployed the rescuer from an altitude of 100 feet AGL; during the delivery of rescuer, medical and Bauman bag some incidental contact with tree branches occurred. Once the rescuer was on the ground, she reported "hook clear", and he retracted the hoist. During the retraction, a small tree branch came back wedged on the hoist bumper. He removed the branch and discarded it over a vacant area and then inspected the hook and cable, to confirm no damage. They then lowered a backboard via rope to ground personnel who were with the rescuer. They then departed to look for a 7 meter location. When the rescuer said "ready for pickup", they elected to do the extraction 50 feet higher, to minimize the effect of rotor wash on the ground personnel. Upon hearing "ready for extraction" on the radio, he brought the hoist cable up. He added that during the lift, the rescuer and victim made light contract with tree branches. Once clear of the trees, the rescuer and victim started to spin; he asked the pilot for some forward airspeed, after announcing "axis clear", to stop the spin. He added that it appeared the rescuer's legs were parallel to the victim, and thought it was due to the spinning. The hoist operator stated that after the helicopter gained forward airspeed, the spin had slowed and almost stopped. He noticed that the rescuer was riding in a position lower than normal. At which time, she fell from the rigging leaving the patient and medical bag still attached to the hoist hook. Several fire department emergency personnel were with the patient, when the STAR Flight helicopter arrived on scene. Emergency personnel reported that the rescuer was inserted below their location and had to climb slightly uphill to the patient. One of the persons stated that there was plenty of lighting, but didn't recall if people were using headlamps. They had also retrieved the backboard for the rescuer. He added that then the rescuer said she was about to call the helicopter in, he asked what else do you need, and she responded to just get the catch hook. One of the other individuals got the hook and handed it to her. He added that he didn't see the hookup and she gave the 'thumbs up" and they took off into the air with no hesitation. The rescuer and patient looked "okay". They moved into a small tree and looked like the rescuer was protecting the patient. He added that they stopped, lowered and moved over, or moved over and lowered at the same time; that it looked controlled or surgical, and then they took off into the sky. Another one of the fire department personnel added, that he asked the rescuer if she needed one of them to safety her gear, and she responded that she was fine. He added that he didn't see the hookup or signal; the rescuer and victim departed quickly and everything looked like other calls by STAR Flight. He stated that the patient's left foot went into trees a little bit, and he thought, that might hurt. They repositioned to get out of the trees, and then disappeared above the tree line. He added the rescuer looked chest level with the patient; he had seen three of these (type rescues) and it didn't look abnormal. Another fire department personnel reported that he was holding the HRV for the rescuer. She then took it from him and it looked like she hooked up the Bauman bag and backpack. He didn't see her hookup, but he didn't notice everything that was going on. He saw the "thumbs up" and they took off. He added that when the rescuer and patient went into the tree, he thought he heard someone holler; he was the only one that heard it, but figured it was the patient because every time they moved the patient or something hit her ankle, she'd holler out. He added that he didn't hear it clear enough to know who or what was hollered. He added that during the lift off from the ground, the rescuer was hunched over the patient. When they got into the tree they stopped, he couldn't tell if they were lowered down, but they moved over and they were gone. Another emergency personnel added that the rescuer had the HRV in her possession. She called the helicopter in and the hook came, which had two spot lights and a big orange boom around it. One of the other individuals handed her the hook, and she hooked into a bull ring; it happened fast. The rescuer gave a "thumbs up", and then they started lifting her. On the rise up, they got into the tree slightly, looked like they lowered her, backed up a couple feet to clear the tree, and they were gone. He added they were riding good and it looked like the rescuer was slightly above and over the patient, protecting the patient from the tree, and departed without a hiccup. Additional fire department emergency personnel were located at the landing zone (7 meter location) and positioned around the track so the helicopter would have a clear spot to land. They reported that the helicopter came in, entered a hover, and lowered the patient to the ground. Typically, the helicopter crew will disconnect the patient, so initially; they did not approach the helicopter while it was in a hover. The noise of the helicopter also made radio transmissions difficult to hear. One of the personnel was able to radio contact with helicopter crew to confirm they wanted one of the firemen to disconnect the patient. The person reported that there was one connection to get the big hoist off; the big bull ring had the medical bag and the Bauman bag on it. After disconnecting the patient, the helicopter landed nearby. He added that the crew chief asked for the medical bag and stated that they needed to go look for their rescuer. He added that he asked the patient if she remembered, at what point was the rescuer not with you. He stated that the patient responded that she did not know that the rescuer was with her at any point. A citizen came upon the fallen rescuer and called 911; emergency personnel who responded to the injured hiker were first on scene. The rescuer's helmet was off; the vest was zipped up, the leg straps on, and the triangle [ Tri-link ] was closed. In order to provide medical care, an officer opened the triangle, and the EMT opened the vest, and cut the belts and leg straps. 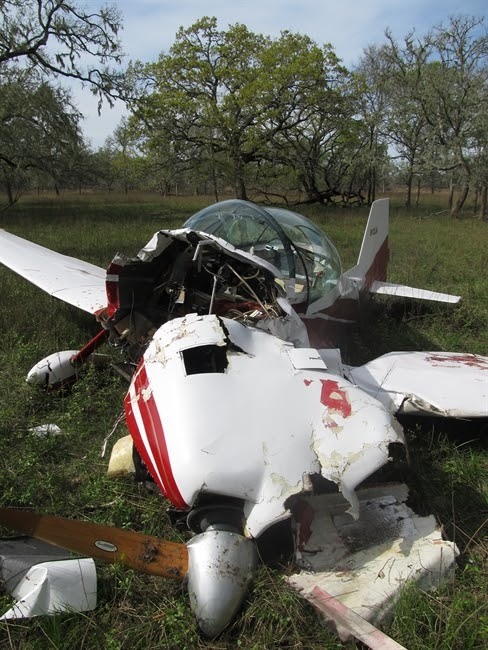 The pilot held a commercial pilot certificate with ratings for helicopter; airplane single and multi-engine land, and instrument ratings for airplane and helicopter. He held a first class medical certificate that was issued on November 11, 2014. The pilot had accumulated 5,512 total flight hours with 5,197 hours in helicopters and 315 in the Eurocopter BK 117. The pilot had previous Army and Coast Guard experience; and had been employed by STAR Flight since August 2012. The hoist operator (paramedic) had been employed by STAR Flight since March 2010. He was qualified both as a hoist operator and a helicopter rescue specialist (HRS). The rescuer (flight nurse) was qualified both as a hoist operator and helicopter rescue specialist. She also held a registered nurse license and paramedic certificates. She had been employed by STAR Flight since October 2008. STAR Flight staffs one helicopter at the University Medical Center at Brackenridge, 24 hours per day and one helicopter at STAR Flight's facilities or at Dell Children's Medical Center, 12 hours per day. Both of these base locations have facilities for crew rest. Crews are normally scheduled for 3, 12 hour shifts (1st shift 0700-1900, 2nd shift 1000-2200, 3rd shift 1900-0700) followed by 3 to 4 consecutive days off the flight schedule. The rotating schedule is to distribute days, nights, and weekends across the crews. The pilot, flight nurse, and flight paramedic are assigned as a crew and generally work the same schedule. The rescuer was on the third night (1900-0700) of her scheduled work shift. STAR Flight reported that they comply with Federal Aviation Administration pilot duty day and rest requirements for flight nurses and flight paramedics. The MBB BK117 is a twin-engine, medium utility transport helicopter. It is powered by powered by two Turbomeca Arriel 1E2 engines. The helicopter was modified for STAR Flight operations by Metro Aviation, Inc. Shreveport, Louisiana. The helicopter was equipped with a Goodrich external mount, hoist system. The hoist is fitted with a D-LOK rescue hook, manufactured by Lifesavings Systems Corporation. The D-LOK rescue hoist hook is designed to eliminate problems such as inadvertent engagement and self-release (ring roll-out). The helicopter was equipped with a North Flight Data Systems Outerlink cockpit video and voice recorder system. In addition, the helicopter was equipped with an Avalex AVR-8240 DVR recorder mounted on the hoist system that records operations and communications. A post-accident examination of the hoist and helicopter by the operator, NTSB, FAA, and a technical representative from Airbus Helicopters, Inc., did not reveal any abnormalities that contributed to the accident. The crew wears a flight suit. During hoist operations the rescuer and hoist operator will wear a Tac-Air Rappel vest, with pockets on the front of the vest. One of the vest pockets will contain a mobile radio for communications with the hoist operator and/or the helicopter pilot. The vest is a variant of the TAC-AIR survival vest with two hoisting positions located on the chest (insertion-extraction loops) and one mid-scapular back. The vest is adjustable with removable leg straps. The rappelling hardware can be stored in a pocket until needed. Once attached with two cobra buckles, the repelling hardware is exposed by a two-way zipper allowing access, but not complete separation. STAR Flight's radio for the vest is a Motorola APX 7000 multi-band (UHF/800) and is used to communicate with aircraft and ground personnel. In conjunction with the radio, a remote, push-to-talk switch allows the rescuer to communicate to the aircraft or ground personnel through their flight helmet. The Bauman bag provides a single-point suspension for lifting a patient during a hoist or short-haul evacuation. The bag can be used with backboards or litters. Tri-link (10 mm Maillon Rapide Delta Link- Aluminum) Quick Links, also commonly known as screw links, are used where carabineers are not recommended. The tri-link has a delta shape. They are used on the vest's insertion-extraction loops, and is the attachment point for the HRV's carabineer. The HRV (Helicopter-Rescuer-Victim) manufactured by the California Mountain Company, consists of a steel O-ring, a blue and red webbing attachment points. Each webbing attachment point, has a 1/2" Modified D Red NFPA Captive Eye Carabineer. During a rescue, the steel O-Ring is the attachment point to the hoist hook. The blue webbing and carabineer are utilized for patient and/or equipment connection. The red webbing and carabineer are utilized for the rescuer's connection point. The carabineer is connected to the rescuer's Tri-Link, which is connected to the TAC Air Vest Insertion-Extraction Loops. The rescuer, Bauman and medical bag connections are all made prior to calling the helicopter in for the extraction. As result, when the helicopter deploys the hoist hook, only one connection is required; the HRV's steel O-ring to the hoist hook. The helmet the rescue crews wear is a Gentex Corporation HGU-56, equipped with headphones, one clear and one tinted visor, and a detachable maxillofacial shield. The helmet also has provisions to attach night vision goggles. During night operations STAR Flight crew members utilize NVG's (night vision goggles). ITT Model F4949F, AN/AVS-9 Aviator Night Vision Goggles. Equipment is either supplied as personalized; issued to the individual, or available at each aircraft base as corporate crew equipment. The HRV and Bauman bag are not personalized equipment and is part of the aircraft configuration when dispatched on rescues. Personalized equipment issued depends on the individual's crew position; however, for the rescuer and hoist operator, this typically includes the flight helmet, Tac-Air vest, and equipment such as the Tri-Link. Personalized equipment is inspected by the member and is replaced "on condition". Common equipment is inspected before/after each use, by a member of the crew, and then annually by the equipment custodian, and is replaced "on condition" or per manufacturer's guidelines. At 2151, the Camp Mabry/Austin automated weather observation facility located about 6 miles northeast from the accident site recorded; wind from 360 degrees at 4 knots, 10 miles visibility, a clear sky, temperature 73 degrees Fahrenheit (F), dew point 54 F, and a barometric pressure of 29.78 inches of mercury. At 2153, the automated weather observation facility located at the Austin-Bergstrom International (KAUS) airport about 8 miles southeast from the accident site recorded; wind calm, 10 miles visibility, scattered clouds at 9500 feet, temperature 66 degrees Fahrenheit (F), dew point 62 F, and a barometric pressure of 29.77 inches of mercury. According to the United States Naval Observatory, Astronomical Applications Department Sun and Moon Data, the sunset was recorded at 2006 and the end of civil twilight was 2031. The Moon rose at 1441, and set at 0306 on the following day. The moon was waxing gibbous with 66% of the moon's visible disk. The flight and rescue operations were conducted in night conditions; each STAR Flight crew member is equipped with NVG's and was wearing them on the accident flight. However, the rescuer is not hoisted while wearing NVG's. Barton Creek Greenbelt in Austin, Texas is a recreational area with about with 809 acres. The Barton Creek Greenbelt consists of three areas: the Lower Greenbelt, the Upper Greenbelt and the Barton Creek Wilderness Park. The area provides sheer cliff walls, dense vegetation, swimming, hiking, and climbing areas. There are several access points around Austin for the recreational area. The Travis County Office of the Medical Examiner, Austin, Texas conducted an autopsy on the rescuer. The cause of death was determined to be, "blunt force injuries". The FAA Bioaeronautical Sciences Research Laboratory, Oklahoma City, Oklahoma, conducted toxicological testing on the rescuer. The specimens were negative for tested drugs and alcohol. Examination of the rescuer's Tac-Air vest was conducted; the vest's insertion/extraction loops displayed no evidence of failure or suspicious marks. Belt buckles and leg straps also were absent any evidence that might have contributed to the rescuer's fall. The HRV and Tri-link were also examined. An on-site visual inspection found no evidence of a malfunction. An examination at the NTSB laboratory under a high power microscope, also found no evidence of witness marks or abnormalities that would indicate a failure of the units. The hoist and cockpit video data cards were shipped to the National Transportation Safety Board (NTSB) Vehicle Recorder Laboratory in Washington, DC, for review. A video group that consisted of representatives from the NTSB, Federal Aviation Administration, Airbus Helicopters, and the operator was formed. The group was convened at the NTSB Recorders Laboratory, Washington, DC, to view and document the video from the hoist camera. Based on the details of the accident, the video/recorder review board only viewed a portion of the helicopter's cockpit video for the relevant safety checks and the accident sequence. It was determined that the video did not contain information relevant to the accident. (The video report is located in public docket for this accident). STAR Flight (Shock Trauma Air Rescue) is a public safety, government based air rescue program provided by Travis County. Based in Austin, Texas, the program is funded by and reports to the Travis County Commissioners Court through the County Manager over Emergency Services. The program operates under 14 CFR Part 135 and in public aircraft operations depending on the mission. The program provides transport and emergency assistance from scenes, inter-facility transfers with and without specialty teams, firefighting, search and rescue, and law enforcement support. Normal service area includes nineteen central Texas counties; however, STAR Flight is regularly requested to provide service outside the normal area. The committee uses the cockpit and hoist recording systems and a formalized Public Mission Debrief / AAR form (completed by the crew) to evaluate all public mission events (training and response) compliance with established standards, individual and crew feedback, and areas of improvement that include standardization, training or equipment changes. The committee is to meet monthly or as required. The committee did not review the video recording for this accident. AUSTIN (KXAN) — The National Transportation Safety Board has released its factual report on what happened the night of STAR Flight nurse Kristin McClain’s death. The NTSB says the factual report is a narrative of the factual information collected by the investigative team. 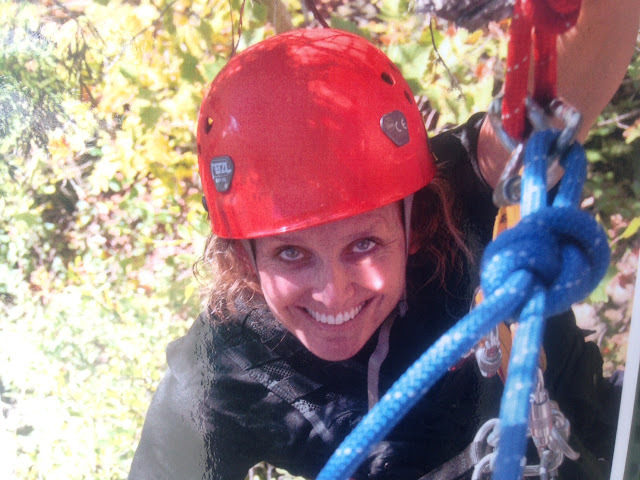 McLain, 46, died when she fell during an evening rescue operation on April 27, 2015 on the greenbelt of Barton Creek. According to the report, McLain and the patient, who had an ankle injury, cleared the trees when being hoisted up to the helicopter. They then began a steady spin. To stop the spin, the pilot started moving the helicopter forward. The hoist operator said the spin had almost stopped, but he noticed that the flight nurse was riding in a position lower than normal. A short time later, McLain “fell from the rigging leaving the patient and medical bag still attached to the hoist hook,” according to the report. A different firefighter said he was holding the Helicopter-Rescuer-Victim (HRV)—which consists of a steel O-ring, a blue and red webbing attachment points—for McLain. The firefighter told investigators it looked like she hooked up the Bauman bag and backpack but he didn’t actually see the actual hookup. Another emergency personnel said someone handed her the hook and she hooked into a bull ring and took off. Examination of McLain’s vest and equipment showed no abnormalities or any evidence of equipment malfunction. When rescuers from McLain’s body, her helmet was off, her vest was still zipped, the leg straps on and the triangle [Tri-link] was closed. A Tri-link is used where carabineers are not recommended and is the attachment point for the HRV’s carabineer. A toxicology report indicated no drugs or alcohol in McLain’s system at the time of her death. While the factual report does not indicate what might have caused McClain’s fall, the agency is expected to release the brief of accident/probable cause report in the next few weeks. A seven-year STAR Flight veteran, McLain joined STAR Flight in 2008 and was one of only two female nurses on the STAR Flight staff. 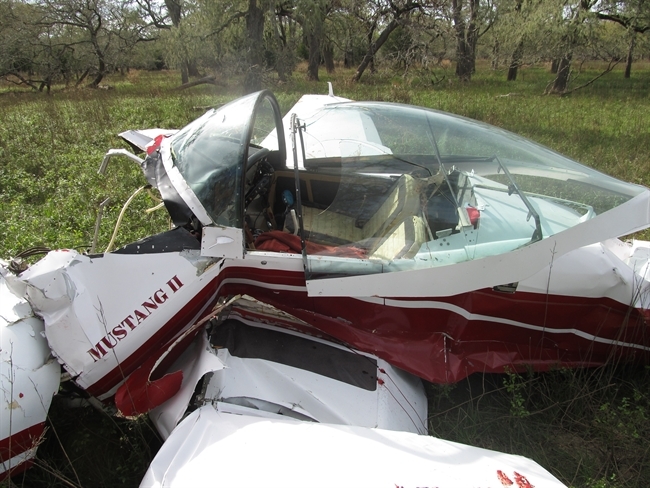 On March 4, 2016, at 1230 central standard time, an Ariosto Mustang II experimental airplane, N12JA, impacted terrain following a reported loss of engine power near Normangee, Texas. 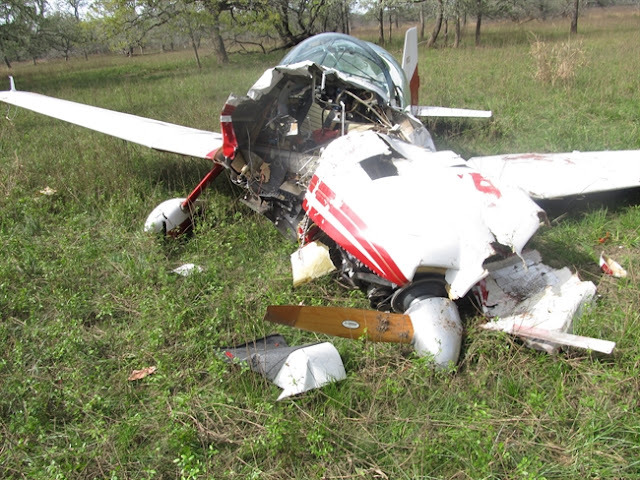 The private pilot sustained serious injuries, and the airplane sustained substantial damage to the fuselage. The airplane was registered to and operated by a private individual as a 14 Code of Federal Regulations Part 91 personal flight. Visual meteorological conditions prevailed at the time of the accident, and no flight plan was filed. The local flight departed at an unknown time. According to a Federal Aviation Administration inspector, examination of the accident revealed the airplane impacted terrain in a left wing, nose low attitude. 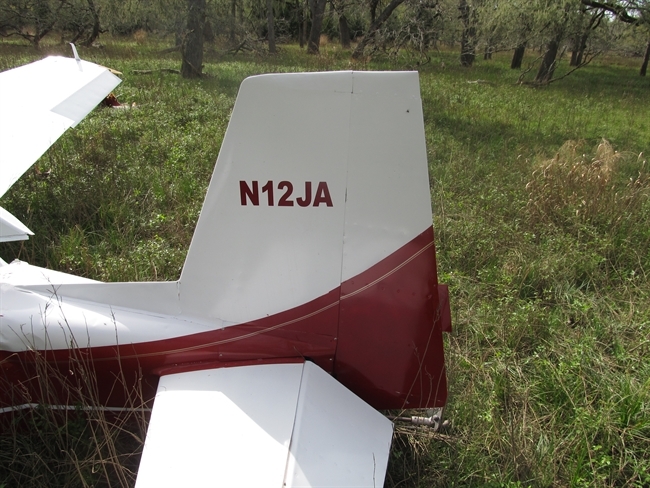 The airplane came to rest upright in a field that was surrounded by trees. The engine and firewall were separated from the fuselage. The left wing fuel tank was compromised and right wing fuel tank contained an unknown amount of fuel. One propeller blade remained attached to the hub and no damage was noted, and one propeller blade was separated near the hub. The pilot sustained serious injuries and was airlifted to the hospital from the accident site. 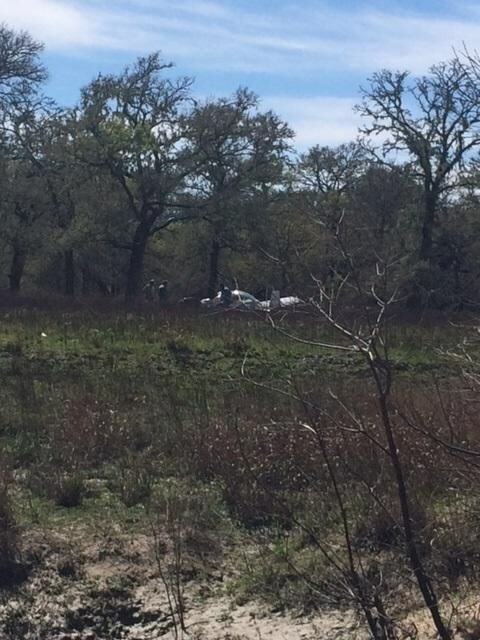 ROBERTSON COUNTY - The Robertson County Sheriff's Department has confirmed that a single-engine plane has crashed in East Robertson County. According to DPS, the pilot was life-flighted from the scene. The extent of those injuries have not been released. The accident is near James Cemetary Road and FM 1940 in East Robertson County between Franklin and Normangee. You are encouraged to avoid the area. EMS, fire department and law enforcement crews are all at the scene. 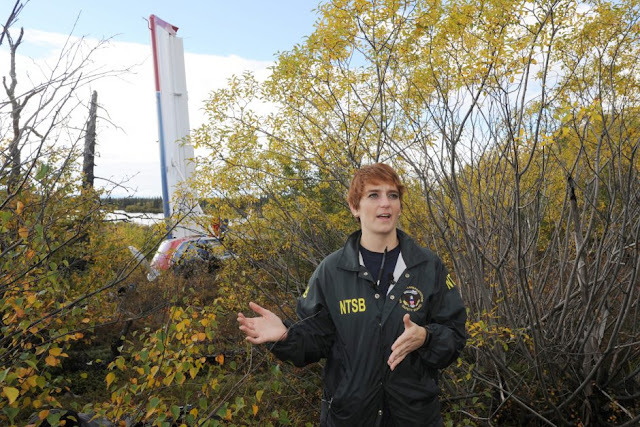 National Transportation Safety Board aviation accident investigator Millicent Hoidal speaks to the media while conducting an on-scene investigation at the Iliamna crash site of the de Havilland DHC-3T Turbine Otter that crashed during takeoff from East Wind Lake in the background on Wednesday, Sept. 16, 2015. The floatplane crashed early Tuesday morning with a load of fishing guides and clients killing three people. NEW YORK – Alaska is more dependent on airplanes than any other state in the country. But with that dependence comes danger: during the summer, Alaska faces an average of one plane crash every day. The region’s plane accidents range from the historic crash that claimed the life of Senator Ted Stevens to the single-engine plane that crashed into an office building in downtown Anchorage in 2015. The new Smithsonian Channel series, ALASKA AIRCRASH INVESTIGATIONS, goes behind-the-scenes with unprecedented access to the National Transportation Safety Board’s (NTSB) Alaska “Go Team.” For the first time, The NTSB has allowed a television crew to follow its Alaska unit as it investigates the more than 125 crashes that occur in the state every year. The series, comprised of six hour-long episodes, premieres Sunday, March 13 at 9 p.m. ET/PT. ALASKA AIRCRASH INVESTIGATIONS rides along with the NTSB and its interagency partners as they work together to determine the probable cause of aircraft accidents. These NTSB investigations provide a window into the integral role of air travel in Alaskan life, while raising awareness that might prevent future accidents. ALASKA AIRCRASH INVESTIGATIONS follows five NTSB members as they risk their lives in extreme environments to access remote crash sites in the unpredictable Alaskan wilderness. From dense forests to raging rivers, there is no place impenetrable for the “Go Team.” Every investigation tests these brave men and women, from the seasoned veterans to the rookies who are just beginning their careers in air safety. • Clint Johnson – Regional Chief of the NTSB Alaska Regional office in Anchorage, Johnson has 18 years of crash site experience and also spent 13 years as a helicopter pilot in Alaska. • Millicent Hoidal – A former NTSB intern and flight instructor, Hoidal is the first female NTSB crash investigator assigned to the Alaska base. • Shaun Williams – A former airline captain and flight instructor who recently transferred from the FAA, Williams believes that it’s his calling to investigate crashes to help enhance safety in the skies. • Chris Shaver – A former corporate jet captain, and now a seasoned NTSB aircraft accident investigator, Shaver has examined his fair share of accidents, but his greatest concern is dealing with the loss of life and the grieving families who put pressure on him to provide answers. • Brice Banning - As a Senior Aircraft Investigator of the “Go Team,” Banning sees each crash as both a human tragedy, and a fascinating mystery to be solved. Every investigation has three major phases: the on-scene; the wreckage layout; and the off-scene. For the on-scene, the NTSB must overcome Alaska’s rugged terrain to reach the accident site where they document the scene, collect wreckage, and gather evidence. On the wreckage layout, the NTSB painstakingly examines pieces of the wreckage to determine if there were any mechanical issues with the airplane that could have led to the crash. 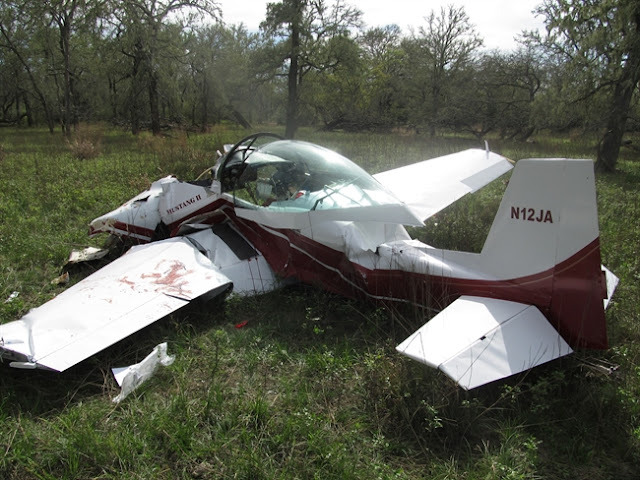 Finally, the NTSB delves into the pilot’s history and plane records. Each phase is a piece of the puzzle, and when evidence in a stage is missing, the puzzle becomes more difficult to solve. Each case presents its own unique set of challenges. From the nearly inaccessible crash site in dense forest, to the plane that crashes on a major road and bursts into flames, the Alaska NTSB is on the case. Premieres Sunday, March 13 at 9 p.m. ET/PT. When a recent transplant to Alaska crashes a commuter plane west of Juneau, Chris Shaver launches an investigation to see whether the fatal crash was caused by mechanical issues or pilot error. On-scene investigation and a wreckage layout provide few clues. But recovered in-flight data reveals an unusual flight path, which might uncover the true cause of the tragedy. Premieres Sunday, March 20 at 9 p.m. ET/PT. Senior Investigator Brice Banning goes to the site of an Alaskan tragedy: a bush pilot flying over his daughter’s wedding party, who fatally crashed into nearby trees. Meanwhile, Investigator Millicent Hoidal looks into a crash near the remote town of Bethel and uncovers a troubling medical issue that could have contributed to the pilot’s fatal flight. Premieres Sunday, March 27 at 9 p.m. ET/PT. When a Cessna 180 crashes on Alaska’s Kenai Peninsula, two lives are lost… along with nearly all the evidence. After a terrible post-crash fire, investigator Shaun Williams must piece together eyewitness accounts from a grieving community, and compare that with the surviving pieces of wreckage. It takes a trip to an Alabama engine factory and back to Alaska to begin to make sense of the mysterious final sounds of the aircraft. Premieres Sunday, April 3 at 9 p.m. ET/PT. A tourist flight crashes just after take-off from a remote fishing lodge, killing several passengers. The wreckage layout reveals that neither the airframe nor the engine caused the crash. Now the “Go Team” must launch a probe into the bizarre noises described by the survivors in the last minutes of the flight, and painstakingly determine whether the aircraft was overloaded past its weight limit. Premieres Sunday, April 10 at 9 p.m. ET/PT. Newcomer Shaun Williams gets a report at midnight of a downed plane in a local bay, but by dawn, the aircraft has disappeared under the waters of the Knik Arm. With rescuers and helicopters attempting to recover the wreckage, Williams tries to determine what caused the plane to plunge only two miles before its planned landing. When the fatal crash is pulled from the water, the NTSB rules out mechanical problems, leaving the possibly damaged GPS as the only evidence that might solve the mystery. Premieres Sunday, April 17 at 9 p.m. ET/PT. A 23-year-old pilot’s Cessna plunges nose first into a public road near Big Lake, Alaska, and Investigator Millicent Hoidal must piece together the evidence remaining from the fiery crash. A set of missing logbooks and a propeller with no serial number complicate the investigation, which must rely on a deep dive into the young pilot’s history and training to determine the final cause of the disaster. ALASKA AIRCRASH INVESTIGATIONS is produced by Lucky 8 TV, LLC and Vesper Entertainment for Smithsonian Channel. Executive producers for Lucky 8 are Gregory Palmer, Kimberly Woodard, Gregory Henry and Isaac Holub. Executive producer for Vesper Entertainment is James O. Fraioli. Executive producers for Smithsonian Channel are Tim Evans, Charles Poe and David Royle. It was a stressful situation for state and Detroit police - and a potentially deadly one - for a 25-year-old man driving erratically on Detroit's east side. "Detroit had received information from this individual's either loved one or their mom that he may have been suicidal," said Michigan State Police Lt. Mike Shaw. 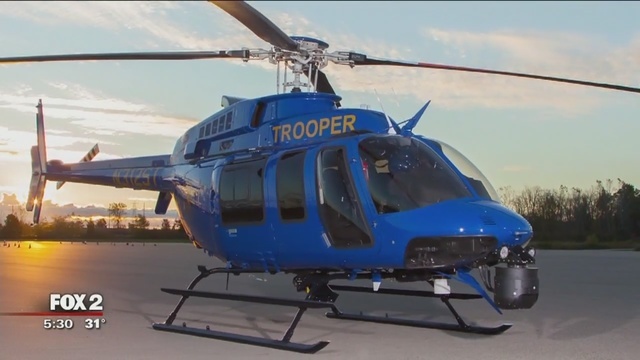 After that call to Detroit police, state troopers used night vision cameras inside their "Trooper Two" chopper tracking the driver's every move. "They heard they had been involved in pursuit, so our helicopter went over the area to look for the vehicle they had lost," Shaw said. The man could be seen running traffic signs, rolling through intersections and open fields. The helicopter followed the driver and relayed messages to Detroit police, later noticing the man cutting through Chene Park toward the water. With Detroit police in pursuit and Michigan State Police above, the man parked his car then ran into the Detroit River and jumped in. State troopers lit the scene from above as officers below, pulled him to safety. "If we wouldn't have found him at the very beginning when Detroit police lost him in their pursuit," Shaw said. "Maybe we would have had a different outcome." Shaw said this is just one way that Trooper Two can be used in the air six days a week ready to aid state and local police. Sun Air Express has a new owner but will continue to provide the same service to Lancaster Airport, it was announced Friday. The commuter airline, which has been flying here since November 2012, has been sold to Southern Airways for an undisclosed price. Sun Air will continue to connect Lancaster Airport with Pittsburgh and Washington D.C. with the same schedule and rates, and initially with the same aircraft. Sun Air, based in Fort Lauderdale, Florida, serves eight cities in the mid-Atlantic region. Its Lancaster passenger counts have risen sharply in recent months. Memphis-based Southern serves four cities year-round and five on a seasonal basis, plus offers charter flights — all in the Southeast. Southern has no plans to add flights to connect Southern’s market to Sun Air’s. Stan Little, Southern chairman and chief executive officer, in a prepared statement was upbeat about the acquisition’s impact on Sun Air passengers. Those passengers “will see only positive change from this merger,” said Little. “All tickets issued will be honored. The schedule will be honored. The pilots and airport staff will remain in place,” he continued. “But our communities, and thus our passengers, will soon see upgraded aircraft, more destinations and better schedules,” said Little. Little said most of Sun Air’s fleet of Piper Chieftain aircraft, which are eight-passenger planes with piston engines, will be retired over the next year in favor of Southern’s Cessna Caravan 208 aircraft, which are nine-passenger planes with turbo-prop engines. Southern will keep the Chieftains in reserve, so if a Caravan is out of service, Southern will be able to still fly its routes on time. Southern also will preserve the Sun Air maintenance facility in Lancaster, which employs more than a dozen workers, said Sisson. “That’s a very important part of the operation. We’ll definitely be doing maintenance in Lancaster in the future,” he said. No routes will be added to Lancaster in the near term, said Sisson, but Southern intends to add routes out of Sun Air’s Pittsburgh hub. Cleveland and Cincinnati are possibilities, he said. Likewise, the Sun Air name will remain in the near term. But eventually, the Southern name will replace it, said Sisson. Sun Air spokesman Mark Cestari said passenger counts in Lancaster are up significantly over the past 11 months. In April, the first full month that Pittsburgh service was added to Washington D.C. service, Sun Air sold 56 tickets to or from Lancaster. Last month, it sold 535, its best month ever in Lancaster. 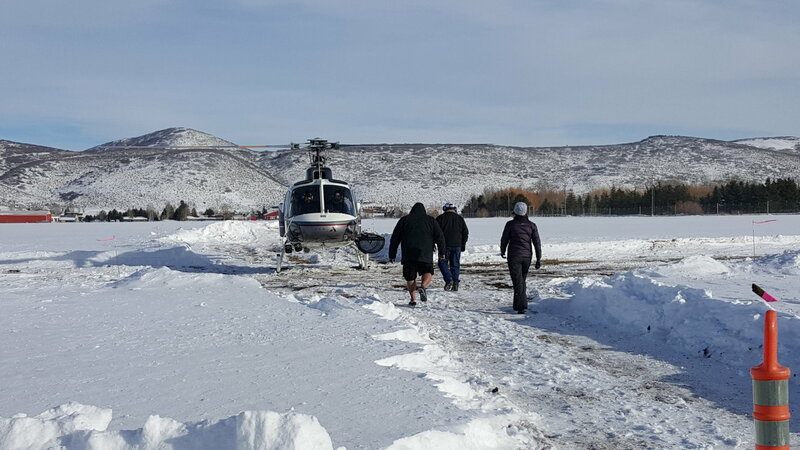 UberCHOPPER operated in the Park City area at the start of the Sundance Film Festival in January, landing in the Snyderville Basin. Messages sent to County Courthouse officials show there were widespread concerns in the vicinity of the landing zones. It was just before 10 p.m. on Jan. 21, the opening day of the Sundance Film Festival, and the buzz had already stretched into a normally quiet Snyderville Basin neighborhood. Helicopters were flying toward Old Ranch Road. It was likely not known at that moment, but it later appeared the helicopters were headed to one of two landing zones in the outskirts of the neighborhood, off Old Ranch Road. The helicopters were shuttling festival-goers from Salt Lake City to Park City, avoiding the notorious Sundance traffic to cut time off the trip. The service quickly drew scorn in the neighborhood and within a few days propelled Summit County attorneys into a courtroom in an attempt to stop the flights. UberCHOPPER, under the same corporate umbrella as the Uber vehicle service, drew the most attention although another firm, called Blade, also operated at the start of the festival. Michele Morris, who lives close to the landing zones, at 9:55 p.m. that night sent an email to Roger Armstrong, the chair of the Summit County Council. The email and others released by the County Courthouse in response to a request under state open-records laws filed by The Park Record illustrate the dismay the flights caused shortly after they started. Morris told Armstrong the sound of the helicopters was "unbelievable." She worried about an elk herd in the vicinity of the landing zones and said Summit County Sheriff's Office dispatchers indicated supervisors "told them there was nothing they could do.
" She asserted there was not a permit or a license for the operation. "I felt like I was in a war zone. I know that there is a herd of bull elk behind 5200 North which is where the copters are landing," Morris wrote. "If my dogs were upset, I'm sure the elk were upset." She said a permit and hearing were needed to build an unrelated trail, and the helicopter service "makes me wonder who is paying whom." "Let's let Uber know that Park City is not the Hamptons," she said, referring to an exclusive community on Long Island, N.Y., where UberCHOPPER has operated. Earlier that day, at 4:14 p.m., Armstrong and other Summit County officials received an email from Brook Connery. The subject line was "helicopters!!!!" Connery was brief as the email expressed concerns. "As you are probably aware, there is a Uber helicopter service landing regularly (like every 10-15 minutes) on Old Ranch Road. Really??? So they can't get a permit to do this in PC proper so they do it in the Bain? Sundance is disruptive enough w/o a helicopter service landing on Old Ranch Road. Thx," Connery wrote with a typographical error in the word Basin. After a reply from Armstrong, Connery said she saw two helicopters "in the sky at the same time so they must be doing a bang up business. Brazen to operate like this." She added she hoped the County Courthouse and the Federal Aviation Administration "can fine them heavily." At 1:39 p.m. on Jan. 21, meanwhile, Armstrong received a message from an Old Ranch Road resident, Lisa Johnson, saying she was in her backyard as a helicopter flew overhead approximately 200 feet off the ground. It landed at a residence, took off toward the south and returned to land at the same place after 15 minutes, the message said, referring to a second helicopter landing elsewhere. "I am a commercial airline pilot and don't appreciate being buzzed by a helicopter at such a low altitude in a residential area," Johnson wrote. The Johnson email indicated she contacted the FAA and a Summit County Planning Department official, leaving messages, and the Sheriff's Office. She said she got a busy signal when she called the Sheriff's Office. "Any help from you regarding this matter would be appreciated. Hopefully this won't continue as I'm sure Summit County doesn't intend to rezone the basin as an airport," Johnson said. The County Courthouse was preparing a response to the helicopter services as the messages were received. Summit County Attorney Robert Hilder and attorneys for the property owners where the landing zones were located appeared in 3rd District Court on Jan. 22, as the County Courthouse attempted to obtain a temporary restraining order against the services. The judge, Kara Pettit, denied the request for a restraining order, saying she did not have enough information to order a stoppage by the end of the hearing. Summit County and the parties involved in the helicopter services the next day reached settlement agreements ending the flights in exchange for the County Courthouse withdrawing a lawsuit that sought the same result. None of the sides admitted fault as part of the settlements and the agreements did not call for financial compensation for any of the parties. In some of his responses, sent prior to the hearing and settlements, Armstrong said the county attorney wanted an injunction, but it would be difficult to obtain one immediately. He said the FAA had been informed of the situation. "I regret the disruption to the neighborhood. Uber does not have permission to operate a helicopter service in Summit County and was told yesterday it could not land in the Basin. The helicopter service is in violation of County codes," Armstrong wrote in one of his responses, sent to Connery on Jan. 21 at 7:10 p.m. The next day, at 9:48 p.m., he wrote back to Connery after she sent another message thanking him for the efforts and criticizing Uber as a "very arrogant organization." "Thank you Brook. Wishing you a peaceful night," Armstrong wrote. In an interview after the release of the messages, Armstrong said people who lived in the neighborhood were unaware the flights were planned. The helicopter services did not share details about the locations of the landing zones with the County Courthouse prior to the flights starting, Armstrong said. "Suddenly, if you live in the area, on Thursday helicopters start flying," Armstrong said. He said he received three or four calls regarding the flights and an additional four or five text messages. "When it becomes one after another . . . that starts to be extremely burdensome," Armstrong said. The Federal Aviation Administration has touted the benefits of its shift to a modern, more sophisticated system for managing air traffic. NextGen, the FAA says, reduces carbon emissions, speeds departures and will save millions, even billions, of dollars in fuel costs. In Washington alone, where new flight patterns were put in place last year, the agency estimates that airlines will cut their annual fuel consumption by 2.5 million gallons. But from the heart of Silicon Valley, which is home to some of the great minds that created the technology that powers NextGen, to Washington, home to many of those responsible for the rollout of the system, the switch has aggravated an old problem: airport noise. Since the FAA began rolling out NextGen, noise complaints have jumped dramatically in communities as diverse as Phoenix; Palo Alto, Calif.; and the District. At San Francisco International Airport, where new flight patterns were put in place in March 2014, noise complaints skyrocketed more than tenfold from 14,726 in 2014 to 152,336 last year. In the District, there were 1,286 noise complaints in 2014; by 2015, the year NextGen changes were implemented, complaints jumped to 8,670 (although airport officials are quick to note that 6,500 of the complaints last year came from the same person). Even so, residents say complaints have risen dramatically. “D.C. has become a poster child for what is happening all over the country,” said D.C. Del. Eleanor Holmes-Norton (D), who has been critical of the FAA’s process for notifying communities about the impact of flight-path changes. NextGen is a $29 billion initiative designed to modernize the nation’s air traffic control system. Explained in the simplest terms, NextGen will replace the country’s World War II-era radar setup with satellite navigation, allowing planes to fly more direct routes, saving fuel, improving safety and speeding takeoffs and landings, agency officials say. In Atlanta, where the system is in use, FAA officials say the effort has helped speed up departures by 48 percent at the nation’s busiest airport. But one consequence of the shift in air traffic is more noise for some people on the ground. In other cases, people in areas that never had airplanes flying overhead now feel as if they live on a runway. Take the Northern California community of Santa Cruz, where residents now contend with airplane noise even though the airport is 60 miles away. Airport noise is a perennial issue, but anti-noise groups have powerful allies, including Sen. John McCain (R-Ariz.). In the House, California Reps. Anna G. Eshoo (D), Jackie Speier (D) and Sam Farr (D), as well as D.C.’s Norton, also have been vocal participants in the Quiet Skies Coalition, which includes members from the District, Illinois and New York. Frustrated residents also have turned to the courts. Last June, the city of Phoenix filed a lawsuit in federal court seeking relief. In August, a coalition of community groups in the District filed its own action seeking a review of the new flight paths. Both cases are pending in the U.S. Court of Appeals for the District of Columbia. After months of what some viewed as stonewalling, FAA officials — prodded in part by Congress — have taken a more proactive approach, conducting meetings with affected communities and pledging more-aggressive outreach in areas where NextGen implementation is in its beginning stages. “We are very concerned about doing everything we can do to be as responsible as we can about noise,” FAA Administrator Michael P. Huerta said. As required by law, agency officials conducted environmental and noise studies in each of the communities where the new routes were put in place. In the District, FAA officials said the studies determined that there would be little or no impact on the community. Try telling that to Tomasita Villarroel. She and her family live just a few blocks from Hardy Recreation Center in the Foxhall neighborhood in Northwest. In 1999, when house hunting, the family picked Foxhall because it was convenient to everything. But over the past year, that convenience has been overshadowed by the noise from a steady passage of airplanes overhead. Just a few weeks ago, her son Luke’s teacher sent a note home saying the preschooler was falling asleep at lunchtime. Villarroel is convinced it is because of the noise. “He wakes up regularly [at night] and can’t go back to sleep,” she said. She has tried a variety of strategies. She does not let him nap during the day, hoping he’ll be so tired that he’ll sleep through the noise, but so far it’s not working. Norton said she thinks the FAA used outdated measures in its noise studies. Huerta said the agency is reexamining how it measures noise, noting that current standards date from the 1970s. In the case of Reagan National Airport, FAA officials said the new inbound routes were designed to follow the Potomac River, but one piece of land that lies under the flight path includes neighborhoods such as the Palisades, Foxhall and Georgetown. The agency is part of a working group that includes residents, airport officials and the airlines and is trying to find a workable compromise. But some have doubts about whether officials are paying anything but lip service to their concerns. “I’m always hopeful. You always have hope, but we also have a legal track as well,” said Ed Solomon, president of D.C. Fair Skies Coalition. “When they come to us with the argument that ‘you knew what you were doing, you knew there was an airport there,’ well, yes,” he said. But with new flight paths in and out of the airport – “Things have changed. The noise started coming to us. Those flights have come closer to the District of Columbia,” Solomon said. On a recent day, children dashed around the playground at the Hardy Recreation Center, launching themselves off the cheerfully green dinosaur and squealing with delight as their swings climbed higher. Above them, plane after plane roared across the sky — more than a dozen within a 20-minute period. And they rarely entertain outdoors. “We don’t even bother now,” Fenton said. Not long ago, Carbine was on a conference call with more than a dozen colleagues around the world discussing proposals for breast cancer research products. It was a pleasant October day and she had decided to open a window to let in some fresh air. “I’m talking and these planes are going over,” she recalled. “And the leader of the call interrupts me and says, ‘Hold on. Stop for a minute, whoever is at the airport — put your phone on mute.’ And I had to say, ‘It’s me, I’m at my house and I can’t put the phone on mute because I’m talking.’ I was amazed he thought I was at the airport — it was funny and it wasn’t,” Carbine said. Norton thinks progress is being made, although it might not be coming quickly enough for those who want relief now. She is confident, though, that a solution can be found.